This is a surprise, first it is far away from home and secondly it is a big city, which I normally don't do. But in this case I went down to PE to do the Alexandria trail and had time on my hand to do a bit of urban exploration. That was all in the center of town, the architecture is grand and interesting. And what was noticed is that the council, much to their credit, spends money on maintaining and refurbishing these old buildings. It is by far not a complete description of the town, the report most likely only scratches the surface. The first farms were established in 1776, but no town yet. In 1799 a military fort was constructed by the British, see more details further down. In 1819 it is reported that there were 35 residents. A major boost came with the arrival of the 1820 settlers. 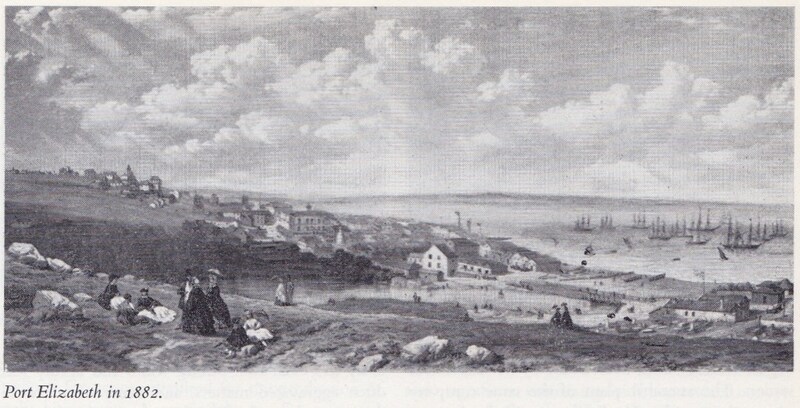 The acting Governor of the Cape, Sir Rufane Donkin, arrived in person to welcome the settlers and at the same time ordered that a township be laid out. 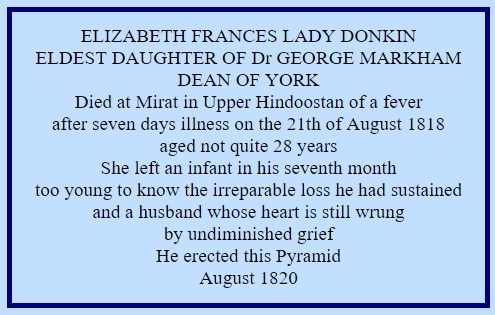 The naming is from his late wife, Elizabeth, more about this when I write about the pyramid. A small muddy river divides the town into a smaller southern and a larger northerly section. The first one is mostly occupied by Malay fisher men. 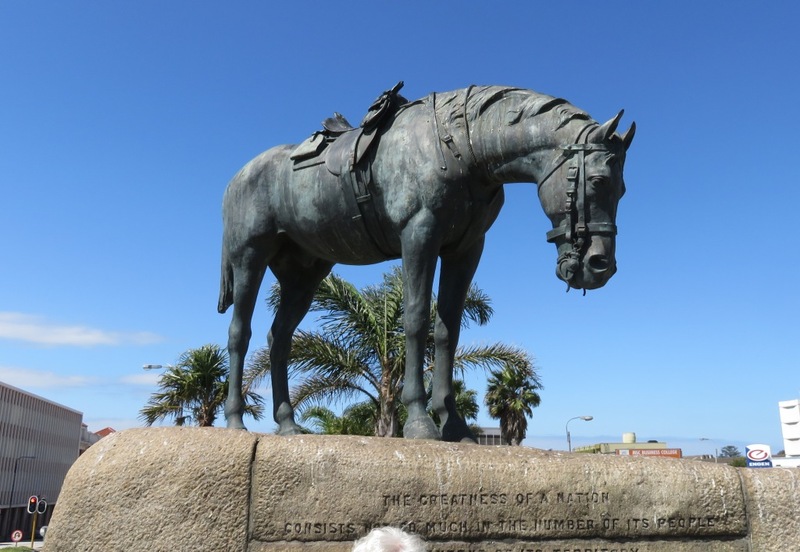 Not far from the Baakens river (note: the original text called it Baker river), at the southern end of main street is the market place, it is bordered on the south side by a most imposing city hall of South Africa. The center of town is marked by a pyramid of granite blocks (see Donkin pyramid). One can get there in a straight line from the pier. Coming from sea the stranger will not be very impressed by the monotonous view of the town, but will be pleasantly surprised by its beautiful buildings and luxurious shops similar to those in large European cities. Between the sea, the market place and the mouth of the Baakens river are gigantic ware houses to store the wool for export and also to temporary store incoming goods. The view from the sea is somewhat enhanced in is simplicity by numerous and beautiful churches. A well equipped hospital is situated on top of the Hill and half a mile from there toward the interior a botanical garden. In the civic center is a well stocked library and regrettably a totally neglected museum. City hall can be seen in the old picture, it is close to the middle, that biggish white building. The fort was laid out to house a garrison of 380 men (I presume not all housed in the fort) and was equipped with eight canons, which can still be seen. Place at a position from where they could have a clear shot over to the harbour at the mouth of the Baakens river. This is the pyramid mentioned by Emil Holub. 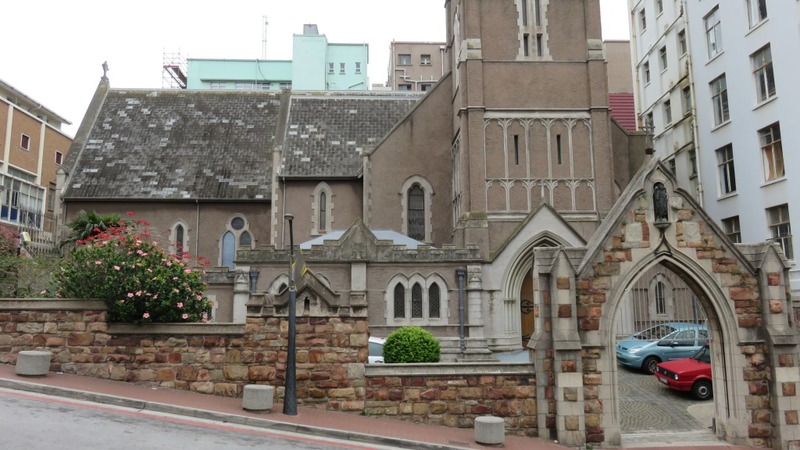 It was built by Sir Rufus Donkin to honour his late wife, Elizabeth, who Port Elizabeth is named after. The full inscription is shown on the right. 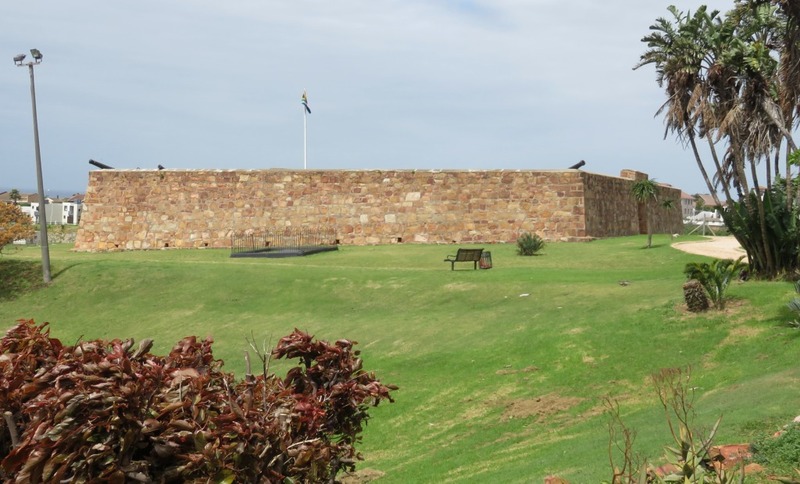 It is situated in the open area referred to as Donkin Reserve up on the hill overlooking the harbour. It is not only the pyramid there, but also numerous pieces of art, a light house and the information center. Yes, a cathedral and here is its full name: The Cathedral Church of St Mary the Virgin. From the outside it doesn't look like anything special, but the inside, that does look like a cathedral. It is an Anglican church. The first Anglican minister was appointed in 1825, Revd Francis McClelland, one of his mission was to build a church. 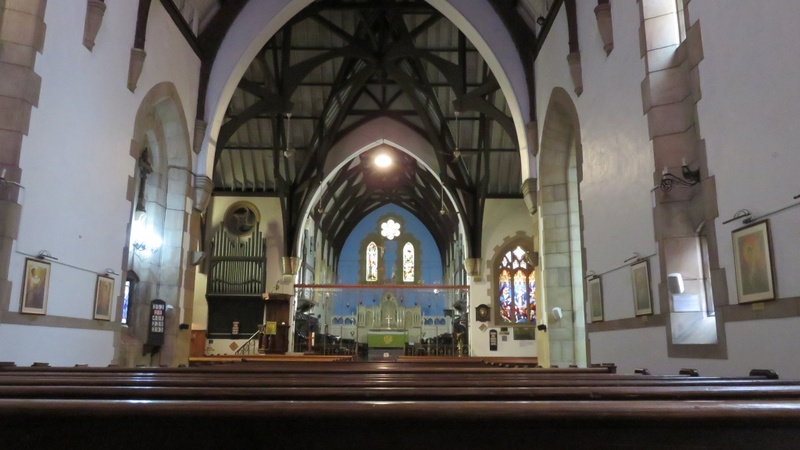 A start was made soon after his appointment and the church was completed and opened for worship in 1832. A fire destroyed the original church in 1896 and it was rebuilt more grand than before. Its final form it got in 1932 when the nave was added giving the church the form of a cross. 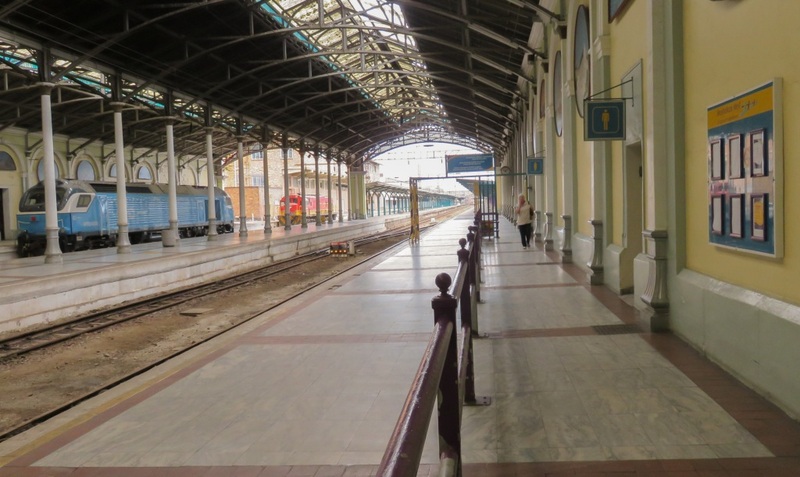 The rail came to PE at around 1875, at that time the first building went up, that one is still in use. Its the building at the head of the station. The north wing was completed in 1893, as well as the roof over the rails. 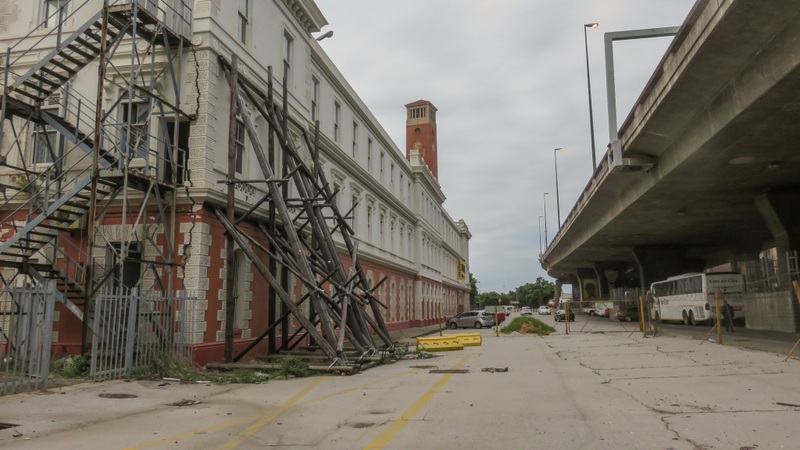 There is a problem with the structure of the north wing, as can be seen on the picture. In my estimate a difficult one, it look like the facade is bulging out. We took the train from here to get back to Vereeniging, we had a pleasant overnight journey and arrived only 2 hours late. 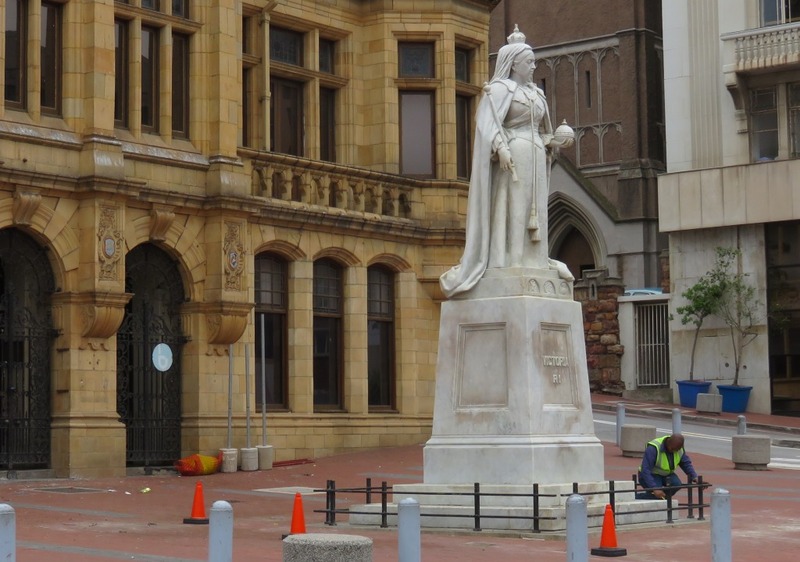 The statue of Queen Victoria made from Sicilian marble was erected in 1903 to honor the late queen. A project paid for entirely by public subscription. It is standing in front of the old public library, erected in 1902 and is seen as a good example of Victorian Gothic architecture. We arrived there at the right time, workers had just finished cleaning it. Some idiots had thrown green paint all over it. Calling them idiots is possibly not politically correct, should we refer to them as anti colonialists, anti imperialists, anti this or anti that? No! They are idiots. 'The greatness of a nation consists not so much in the number of its people or the extent of its territory as in the extent and justice of its compassion. 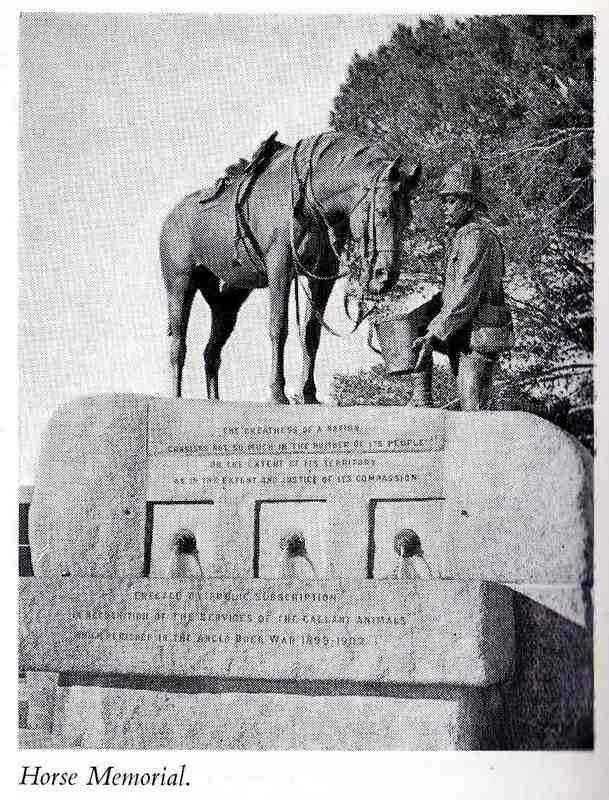 ', that is the inscription on the horse memorial, it carries on: 'Erected by public subscription in recognition of the services of the gallant animals which perished in the Anglo Boer War 1899-1902'. And some idiots went and pulled off the horseman. Most likely the same idiots that had a go at Queen Victoria. See picture above, the building was completed in 1862. In its grand style it symbolises the rising prosperity at the time. Ostrich feathers were very fashionable in the late 1800's, one could talk of a feather boom which lasted from about 1880 to 1914. At its height it is said that the price of feathers per ounce was higher than that of gold. Many people got rich on this, but also went bust at the end of the cycle. More on the history of the feathers in hyperlink 2 and 3. The market building was erected and opened in 1885, it looks like from the beginning it was used to market feathers and for entertainment. An organ was installed in 1893. With the refurbishment of the building starting around the 1980's the organ was re-engineered, using some of the old pipes. More about this in hyperlink 1. 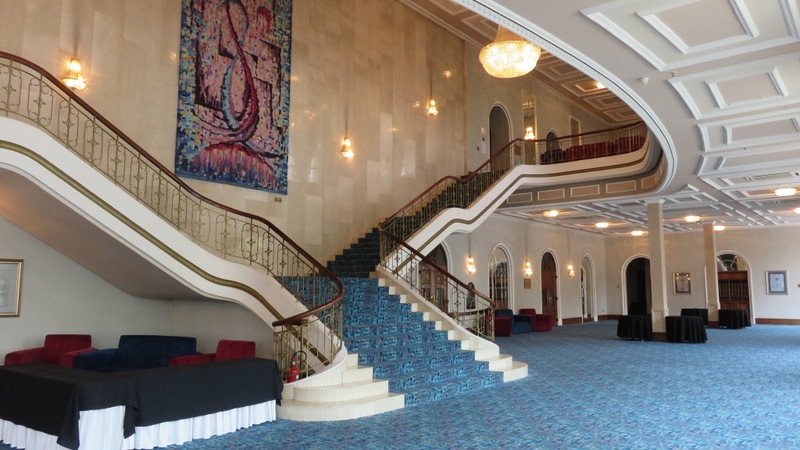 The only picture I show here is that of the stair case, the elegance and the curves impressed me the most in that building. 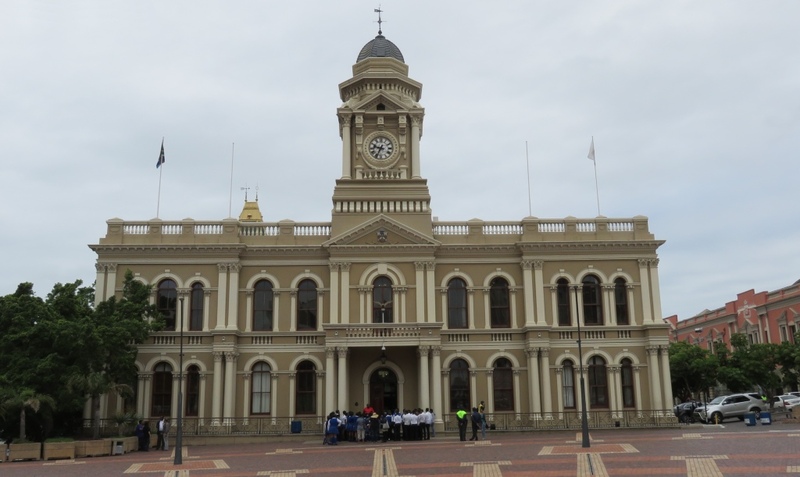 It is a landmark of Port Elizabeth, the tower standing next to the railway station. 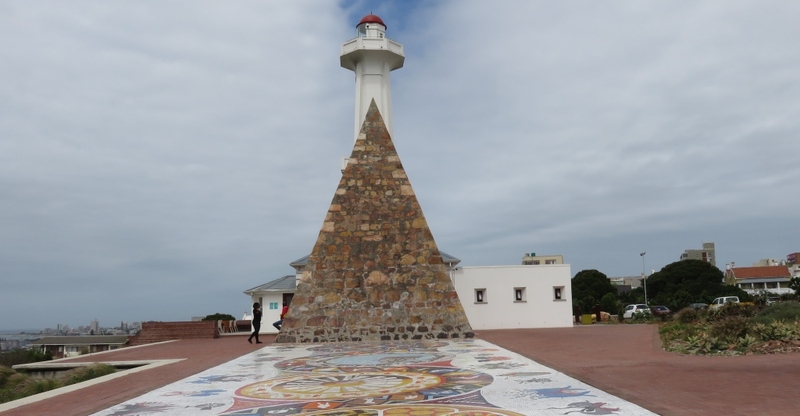 It was built to commemorate the 1820 settlers. I didn't really get to it and it has to wait for our next visit. 1. Emil Holub "Sieben Jahre in Süd-Afrika", subtitle: "Erlebnisse, Forschungen und Jagden auf meinen Reisen von den Diamantenfeldern zum Zambesi (1872-1879)", printed Wien 1881.